Valve has removed the Digital Homicide games from the Steam store following the company attempting to sue Valve and various users who left negative reviews on their titles. Gameranx originally reported that Digital Homicide was attempting to sue Valve and 100 users for negative reviews they left on games like The Slaughtering Grounds, for a total sum of $18 million in reparations. The Gameranx piece, written by Nick Monroe – who has also contributed to One Angry Gamer in the past – notes that Digital Homicide has attempted to sue Jim Sterling in the past for his critiques on their products. They initially sought $10 million against Sterling. This all came after Sterling did some serious investigations into their library of games and realized that there was a lot of suspicious activity afoot. The Techraptor piece shows a list of games by Digital Homicide that is now no longer available on Steam. Twitter user RobotBrush has an image of the games now gone from Valve’s digital distribution storefront. 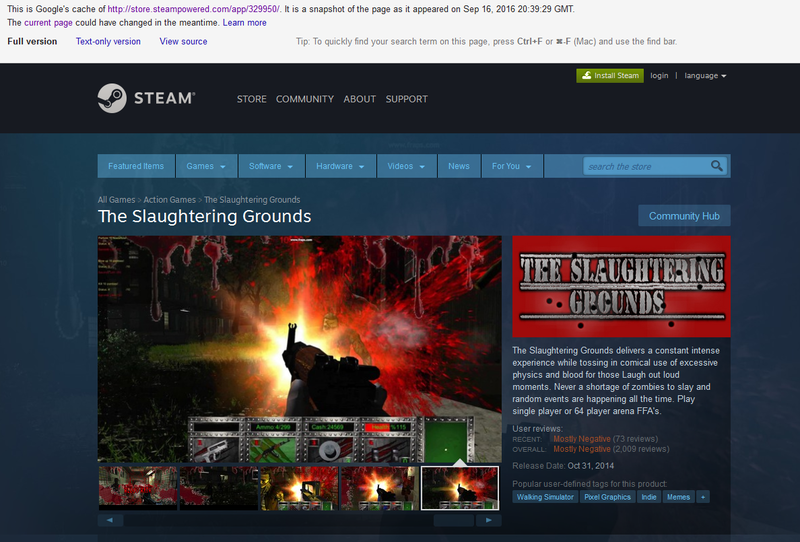 It’s true, if you attempt to click on the link to games like The Slaughtering Grounds, it’ll now take you to the Steam front page instead of the game’s app page. A cached version of the link can be viewed below. The company’s career for developing and publishing games that can be sold on Steam appear to have come to an end. Basically, with this aggressive move against Valve and its customers, Digital Homicide just committed digital suicide.